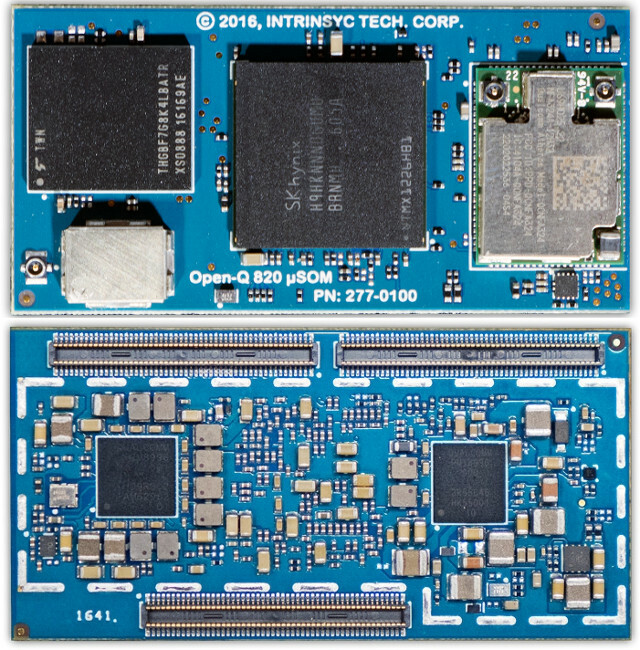 Intrinsyc has unveiled a new smaller version of their Snapdragon 820 based Open-Q 820 system-on-module, simply called Open-Q 820 µSOM bringing the module size from 82 x 42mm to 50 x 25mm, while keeping many of the features of the large SoM with 3GB LPDDR4, 32GB UFS 2.0 flash, 802.11ac WiFi, and Bluetooth 4.1. 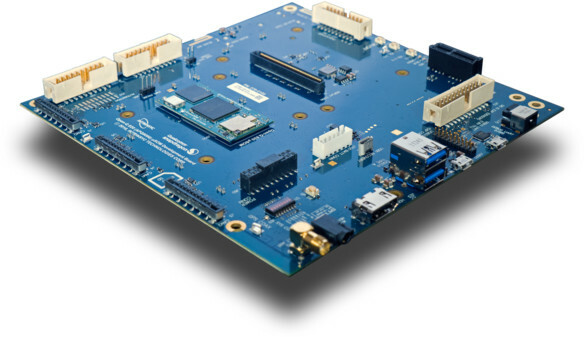 It competes with other small Snapdragon 820 modules such as Inforce 6601 micro SoM. The company provide Android 7.x Nougat support for the module, as well as Open-Q µ820 Development Kit with the module and a baseboard to get started. The baseboard exposes two USB 3.0 ports, one HDMI 2.0 port, a display connector, a mini PCIe slot+ SIM card slot, a PCIe 1x slot, three camera connectors, audio in and out headers, digital I/O expansion headers, a micro SD card and more. Intrinsyc Open-Q 820 µSOM will sell for $239, Open-Q µ820 Development Kit for $579, and become available late February 2017. You’ll more more details on the company’s Open-Q 820 µSOM and Open-Q 820 µSOM Development Kit product pages. Do not complain. Build your own module. Start with LS1043A (4x53armCores, 3xPCIexpress, 3xUSB3.0, sata3, mouser:70$) or with LS1043ASN7KQA (mouser:39$) or with … Broadcom … Lot of options. BTW. Usb-onboard-memory seems to be a new trend.